(from metadata) This map is a simplified version (1:25000) of Thomas Hamilton's glacial geology map of the Upper Kuparuk River region (Hamilton 2003), which provides detailed (1:63,360-scale) surficial-geologic mapping in the Dalton Highway area, from the Sagavanirktok to the Itkillik Rivers, in the west-central Philip Smith Mountains quadrangle. The map area extends from the northern flank of the Endicott Mountains into the Arctic Foothills province. The glacial history of the region affects a wide variety of landscape and ecosystem properties, including topographic variation, abundance of lakes, plant production, soil carbon, spectral reflectance, biodiversity, trace-gas fluxes and heat flux of these landscapes. 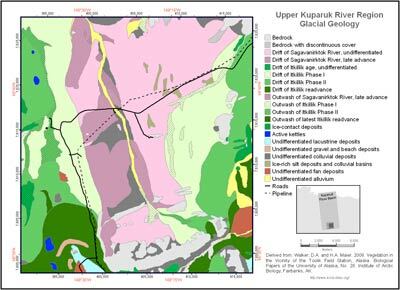 Glacial deposits within the upper Kuparuk River region are assigned to Sagavanirktok (middle Pleistocene, about 780-125 kya), Itkillik I (late Pleistocene, about 120-50 kya) and Itkillik II (late Pleistocene, about 25-11.5 kya) glaciations of the central Brooks Range glacial succession (Hamilton 2003). The legend units are arranged approximately from oldest to youngest.